It's the last day of May and this Maybug turned up to acknowledge the fact, saluting the departing month from the rim of the rain shield. He or she accepted a brief photo session patiently, waggling those most excellent antennae and fiddling with one of his or her armoured wing cases. Then like some doomed rival to the helicopter on a Leonardo da Vinci notepad, he or she whirred off into the branches of a plum tree, undisturbed by my vigilant robin. The moths had a good shape this morning too: the V-bomber outline of three Snouts, two of which were also anxious to depart, but this one stayed long enough for a picture. Another newcomer for the year was the sleekly groomed Wainscot of some kind, probably Common, shown below. Sorry to be vague about that at this stage, but I am going to have to update its ID and that of the following moths later. Morning tea calls and then there's a busy day ahead. So here for now are the other motghs-of-interest from the 150 or so in the trap this morning - busy days. The first needs no research - its Figure of Eighty looks as clear as if a signwriter had been at work. But if you know the others, please let me know too. Have a lovely weekend in any event. A great big graceful moth - one of the Beauties? One of the Carpets. Where's my book? Isn't this one a nice colour? One of the Pugs. But which? Emboldened by my rainy night success on Tuesday, I put the trap out last night in spite of forecasts of more wet weather before dawn. In the event they were wrong but the lamp was in a very snug and dry spot, underneath the treehouse which Penny and I - and helpful neighbours' children - are preparing for our granddaughter. The results were very interesting from such a confined space - a dark nook surrounded by cow parsley, nettles and a hawthorn hedge with the treehouse floor only a couple of feet above the bulb. There were over 60 moths in the eggboxes including quite a few newcomers for the year. Two 'jetplane' moths first: the Pebble Hooktip above and the slightly less Star Warsy Straw Dot below. There was also a solitary Poplar Hawk which woke up unusually quickly and a Cinnabar nestling on one of the metal supports for the lamp. In the same box as the Straw Dot was this Small Magpie, Eurrhypara hortulata, looking a bit like Arthur Koestler's political prisoner in his cell in Darkness at Noon. This moth is actually a micro but so large and macro-like that it features on a special page in the Moth Bible of mciros which may be mistaken for their bigger brothers and sisters. The leafy, low-level surroundings seemed to attract an unusually large number of delicate, fluttery moths - Carpets and Pugs, some of which scooted off while I was fumbling with my camera. Here are some of them below: a Green Pug (one of the very few of that infuriating tribe which are easy to ID), two forms of the rather larger Common Marbled Carpet, a Silver-ground Carpet and a Garden Carpet. Another pleasant debut this year came in the form of the Clouded Border, below, and the eggboxes also hosted 2014's first 'yellow underwing'. This very handsome Large Yellow Underwing, picture left) originally had me excited as a possible absolute novelty. But when it fluttered on to the grass beside my camera strap it revealed its tell-tale petticoat - second picture, below. These moths used to drive me bats in Leeds because they came in numbers far too large to cope with; but here in Oxfordshire they seem - thankfully - more sparse. Lastly, a couple of attractive micros, Celypha lacunana or possibly cespitana (I am checking) and Crambus lathoniellus. There were several other midgets among the eggboxes but they skipped off while my attention was elsewhere. Now I must find my torch and go an examine the gloomy underside of the treehouse floor to see if anything is tucked up there. See update below. We've been in London for a couple of days and so the trap has been dark, although continuing rain would probably have made its use impracticable anyway. But I found this on the streets of London, near King's Cross. Goodness, the capital is paved not with gold but with moths! Hats off to the artist for varying more predictable patterns such as the leaves and flowers to the right of the picture with this fine, fat-bodied insect. I hope that it attracts many ore of the real-life thing to impressively well-parked and gardened WC1. Do moths fly in the rain? After an evening of drizzzle with more forecast throughout the night, I put the trap out to see if moths fly in the rain. The answer here on the edge of Oxford is that quite a few do. My secondary motive was being rather fed up with the way that the current dismal spell of weather has affected trapping. Knowing from experience how effective Mr and Mrs Robinson's simple rain shield usually is, I decided to risk things. It was worth it, both for the interest re the rain and also because the last of the great hawk moths which I can expect here showed up: the Elephant Hawk above. The tally is now: Privet, Poplar, Eyed, Lime, Elephant and Small Elephant. If any of the others come, I will be in clover. The other rain defiers were the cheery Spectacle shown second above, helpfully illustrating the reason for its name, a smart Swallow Prominent, third above, and the micro Cochylis atricapitana ( I am pretty sure) shown below. This little button was perched on one of the two eggboxes which had got damp and may have been enjoying the moisture. There were also four Flame Shoulders, four Treble Lines, a White Ermine and a number of caddis flies of differing sizes, all of them sound asleep as the rain continued to patter down. The weather is such that dressing for outdoors is a constant business of putting on and taking off sweaters and macs. Appropriately, my little brood of Emperor Moth caterpillars has been busy with this too. I feared initially that I was going to suffer my first loss last week, when one of the little creatures left the others, took up a lonely position on the side of the Tupperware box and didn't move for two days. I thought it was dying or dead, but any inspection of the nursery by OfCat or whatever would find a joyful situation. The cattie has rejoined its friends, leaving behind just this - above: the remains of its first skin. That famous book The Very Hungry Caterpillar doesn't deal in detail with the succession of 'instars', the scientific term for the successive stages of a larva's growth. Taken from the Latin for 'likeness', because it involves the appearance of an apparently 'new' and definitely larger, but otherwise similar creature from the old, this sees the animal slough off its skin in order to expand. The equivalent in other species is a moult. Above, you can see a couple of 'new' caterpillars surrounded by the remains of old skins. And below, here are some more munching away at their hawthorn. leaves. I thought you might also like a close-up of the brood's broken eggs following their hatching, compared with the cluster before they emerged - a pic I posted earlier this month after their mother obligingly laid them on her eggbox refuge. While on the subject of hatching, do you like my picture here of a flotilla of ducklings on the canal? Aaaaaah! But actually they're every bit as self-centred and bent on survival as any moth. Just fluffier and cuddlier. As for new arrivals: following last week's intensive inquiry into a suspected Dog's Tooth which may have been a Pale-shouldered Brocade, I am as certain as I can be that this double-fanged newcomer is the Bright-line, Brown-eye (not to be confused with the Brown-line, Bright-eye which flies later in the year. Cinnabar moths are providing a welcome splash of colour among the grey and brown arrivals at this time of year, some demurely asleep in the eggboxes while others arrive more spectacularly. This one crash-landed on the lawn just outside the trap. Its warning colouration kept away my predatory robin and other birds. This is just as well as the moth is closely associated with poison, even in its name. From Roman times to the Spanish empire, digging for cinnabar was an alternative to the death sentence as miners of the ore, which produces mercury, seldom lived for more than three years. Cinnabar caterpillars, whose striking black and yellow stripes are another warning combination, live on ragwort which is poisonous to some animals. They are also cannibalistic on one another. No wonder this little creature isn't bothered about hiding, the strategy favoured by most of the rest of this final catch-up on my recent glut of moths. This even applies to the excitingly-named Flame Carpet, above, as well as the interestingly-shaped Scalloped Hazel below. 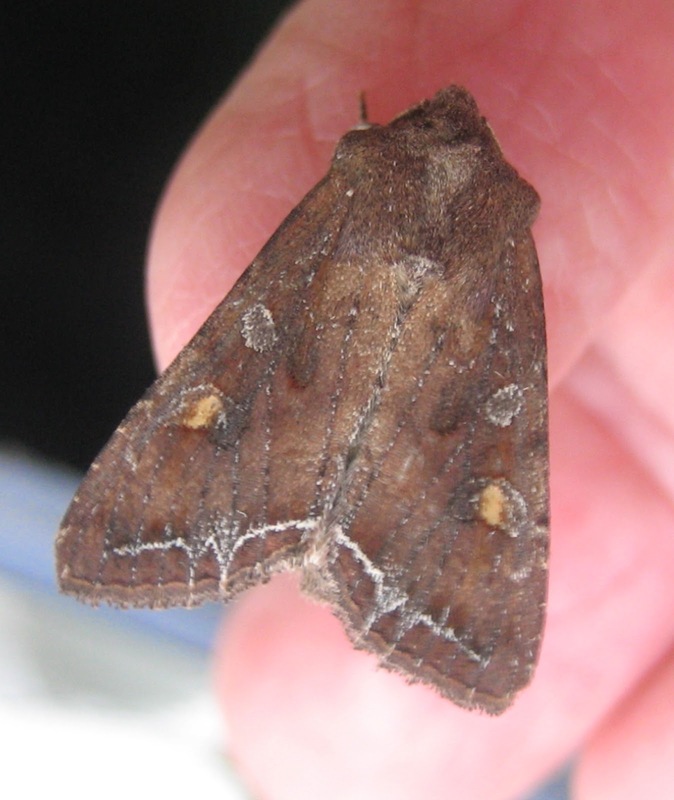 Another sober moth, almost to the extent of resembling a Puritan preacher, is the Setaceous Hebrew Character, unrelated to the Hebrew Character which appears early in the year and has already featured here. They share the name because both have a prominent wing marking which resembles the Hebrew letter nun. Setaceous means 'bristly' but appears to have only the flimsiest reference to this not particularly hairy moth. Two more new arrivals, below, favour a variety of browns for their camouflage. The first is a Middle-barred Minor and the second a paper dart-shaped micro large enough to earn an English name, the Garden Pebble, although its official title is the rather grander Evergestis forficalis. Finally in this section, here's an example of varying camouflage within a species. The moth below is the form combusta of the Clouded-bordered Brindle whose commoner forms are much lighter, rather as in the case of ordinary and melanistic Peppered moths. Try as I might, I cannot get excited about the Pug family of moths which with a few honourable exceptions such as the Lime-speck and the Netted, are confusing similar and generally various shades of brown and grey. I have a special book on pugs which was kindly given to me after I talked about moths to Leeds Philosophical and Literary Society but it's still lost in one of several post-move stacks which will only finally be sorted and accessible again next month. So in case a kindly expert is passing, here are last week's spcimens with my best guesses as to their identity. Corrections most welcome.